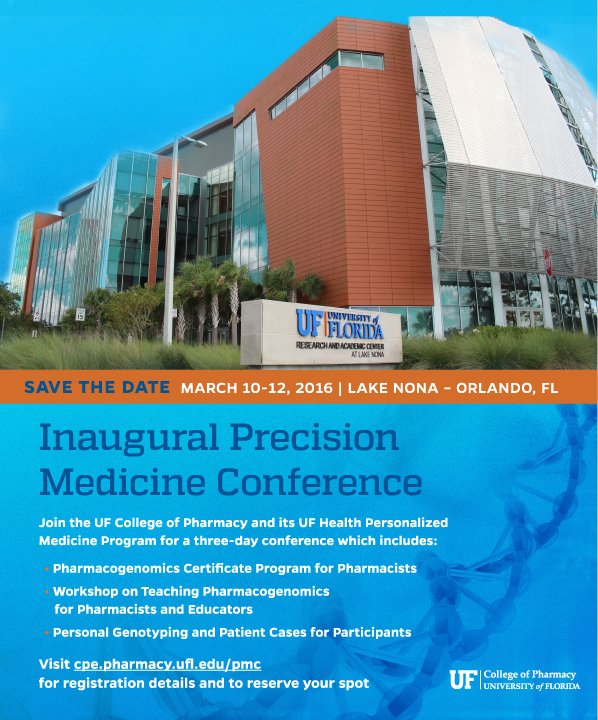 The expanding role of pharmacogenomics in clinical medicine and education will be the focus of the inaugural Precision Medicine Conference hosted by the University of Florida College of Pharmacy and the UF Health Personalized Medicine Program, March 10-12, 2016, in Orlando. Designed for practicing pharmacists and pharmacy educators, the three-day conference will feature a pharmacogenomics certificate program and a workshop on teaching pharmacogenomics. Participants will have the opportunity to undergo personal genotyping for selected pharmacogenomics variants and can apply their own genetic information to solve patient cases during the program. Experts in precision medicine will lead discussions and training activities involving pharmacogenomics education and clinical practice. UF College of Pharmacy faculty and researchers will share best practices in implementing new patient care strategies and educational programs that allow genetic information to be incorporated into patient care and didactic and experiential teaching activities. Pharmacists completing the pharmacogenomics certificate program will receive over 20 hours of continuing education credit. The program will cover a wide range of topics from the principles and concepts of pharmacogenomics to clinical applications and overcoming implementation barriers. Patient case examples will be presented as they relate to multiple disciplines including primary care, cardiology, oncology, neurology, psychiatry, infectious diseases and more. Educators attending the teaching workshop will learn approaches and challenges in incorporating clinical pharmacogenomics into a pharmacy curriculum. Conference leaders will share valuable teaching and assessment strategies to engage students and improve their knowledge and ability to apply pharmacogenomics information in patient care. In addition to being able to participate in personal genotyping, attendees will also learn about the benefits, barriers and tested strategies for incorporating student genotype evaluation into pharmacogenomics teaching and assessment. Clinical and application-based components of the conference will be led by a national team of experienced faculty and clinicians, including pharmacist leaders from UF Health’s Personalized Medicine Program, a multidisciplinary initiative established in 2011. Led by clinicians and researchers from the UF College of Pharmacy, the Personalized Medicine Program works with health professionals and patients at UF Health and across the state to implement new patient care strategies and study methods that allow genetic information to be used as a routine part of patient care. Registration is underway for the inaugural Precision Medicine Conference which will take place at UF’s Research and Academic Center in Lake Nona, Fla. For more information about the event and registration, visit: http://cpe.pharmacy.ufl.edu/pmc/.